An avenue of trees commemorates those who from the district who served in World War One. Planting of the trees commenced in 1918. The original planting of trees was of alternating Peppercorns (Shinus Molle), Cootamundra Wattles and Lambertiana Cypresses. Webster Street was selected for the avenue because it was an important road through the township. The first tree was planted ceremoniously on the south side of the road in honour of Donald McKenzie who was killed in action. There are two Peppercorn trees remaining from the original planting; the remainder are Lambertiana Cypress. Preparations for planting an avenue of honor in the streets of Hexham are making good progress. 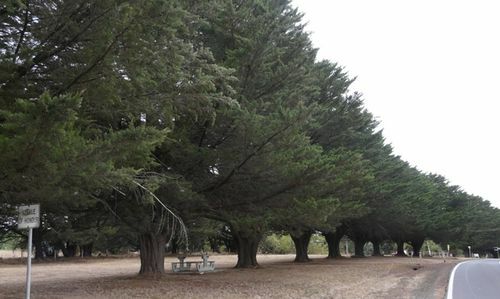 It is intended to make a start this year by planting from the hotel corner and extending up past the school a row of pepper trees and Cootamundra -wattles alternately. Next year the planting will be continued till a tree has been planted for every soldier who has volunteered from this district. The matter is being taken up very enthusiastically. Mortlake Dispatch (Vic. : 1914 - 1918) 17 August 1918. Friday June 20 was observed as Arbor Day in Hexham, when 20 more trees were planted in the streets, as a continuation of the Avenue of Honor commenced last year. At a later date it is intended to place name plates on each tree-guards in memory of the soldiers who enlisted from this district. Camperdown Chronicle (Vic) 15 July 1919.